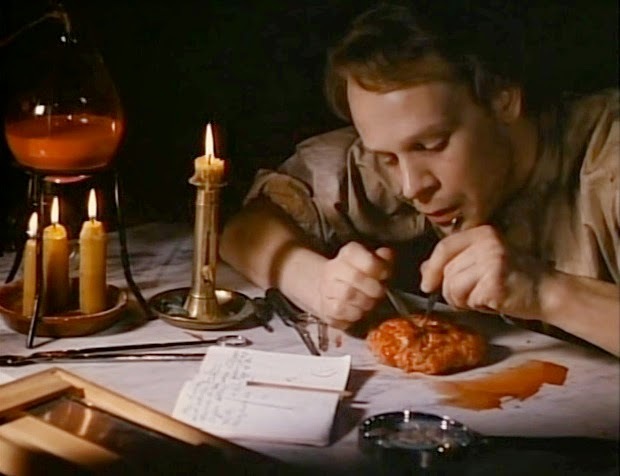 Leon Vitali (BARRY LYNDON) as Victor Frankenstein in Calvin Floyd's TERROR OF FRANKENSTEIN. Producer Jeffrey C. Hogue has written to inform me of the passing last week of Swedish-born writer-composer-director Calvin Floyd. He is best remembered in this country for his documentary IN SEARCH OF DRACULA (1975, narrated by Christopher Lee) and probably the most faithful of all Mary Shelley adaptations, the Swedish-made TERROR OF FRANKENSTEIN (aka VICTOR FRANKENSTEIN, 1977). Among Floyd's other films are a production of FAUST (1964), the crime thriller CHAMPAGNE ROSE IS DEAD (1970), and the period suspense film THE SLEEP OF DEATH (1980). Calvin Floyd was 82. He is survived by Patsy Impey (his companion of 25 years), and also his son and daughter.